Horse arena maintenance is going to be different for each location depending on how many horses are on it per day, what type of footing it is and what disciplined are being performed. This section can break down everything you need to know about grooming your arena including what to look for to know when you need to groom and different types of groomers that are on the market. Keeping your arena in the best shape is going to involve some sort of groomer no matter what surface you choose. You could continue to rake your arena by hand, but you would be spending a lot of man power and hours doing this. There are so many groomers out there on the market that it can be hard to choose one. Ultimately, you will need to choose one that is the best groomer for the kind of arena you have and the type of footing you have. Power groomers or PTO, attach to the on a tractor or skid-steer which runs the groomer. These are often seen on larger agricultural farms, but smaller sizes can be purchased to fit your arena. Power Groomers are often aggressive when grooming. Some may be adjustable to the depth that you want to groom while others are permanently set. Harley Rake: The Harley Rake is interesting in that it can be attached to many different machines. It can be a standalone that you walk behind, attach to a skid-steer or attach to a tractor. You would purchase the actual Rake, and then choose what you are going to attach it to, and buy the correct attachment for that. The prices of the Harley Rake can range from $4,000 to $10,000 depending on what you are attaching it to. Power Harrow: You may see power harrows advertised as great for your farm or garden, but once again these can be used for arenas. Power Harrows can range from 6 feet to 18 feet for large farm fields. Rotary tillers: When connected to tractor these are ideal for greater depth penetration and working up of the ground. They come in compact sizes and have many different tines inside the machine. Most of them have adjustable skid shoes, park stand and often a rear deflector shield. Rotary tillers are best suited for turning your footing over if you are looking to rejuvenate worn surfaces. The prices of this type of power groomer range from $900-$3000. Chain drags, which can also be called a harrow, are the most economical method to lightly grooming your arena. These drags are used to smooth the surface of the arena and are not meant for aggressive grooming. Chain drags are made up of tow chain, and a chain that often is adjustable to how deep you want it to drag, or sometimes you flip the mat over for different effects. Harrows can be dragged behind a tractor, atv, or even a golf cart. Coming in various widths and lengths, the prices also vary. You can find one of these online used on craigslist or buy one new. Chain drags are often not used with footings including fibers because they are likely to separate your sand from your fibers. The prices vary from $170-$500. Tine groomers are the most popular on the market today. These groomers are pulled behind a tractor or atv. Various companies sell tine groomers carrying all different types of tines on the groomers. Danish/Coil Tines: Coil tines are the smallest straight tines. These are around 1/4”-3/4” and are specifically designed for synthetic footing and not digging too deep into the footing. S-Tines: S-tines are named for the shape of the tine. They are shaped this way to unearth and plow the soil or arena material. The shape allows for minimal top pressure as the s-tine works the arena and breaks up or rips up the arena material. S-tines are not recommended for synthetic wax based footings or fiber amendments. Floats or leveling bars come equip on almost all arena groomers. They are typically located directly behind the section of the groomer that digs into the arena. 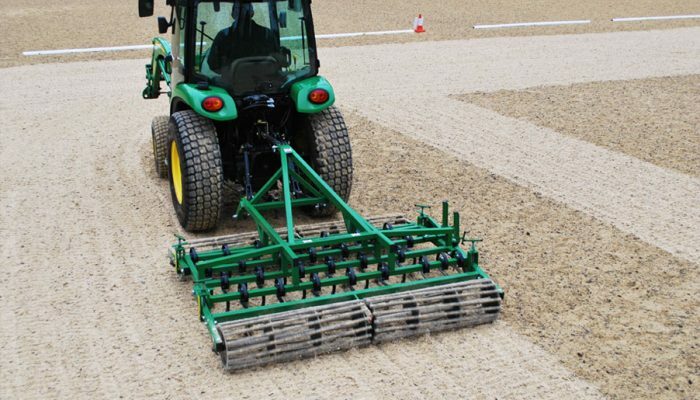 The different tines dig up the arena, while the float creates that new arena look while leveling and slightly compressing your surface to maintain consistency. Arena maintenance is not a one size fits all solution. Type of riding, frequency of riding, skill level, competition or practice, type of material, moisture level, and personal preference are all factors that need to be taken into account when setting your maintenance regiment. The most important part to arena maintenance is the record keeping. Many times grooming is seen as a “hurry up job” so that the next lesson can get in the arena and little attention is paid to direction, speed, or depth of the groomer. Though maintenance need not take a long time systematic record keeping should be an integral part of your daily routine. With these records a system for what works best for your riding preference and performance can be determined. Grooming should be done slowly because a faster grooming habit will displace footing leaving inconsistent depths throughout. Areas of the arena will be too thin and others will be too deep creating an inconsistent and dangerous arena.